The M2-S™ fingerprint scanner from M2SYS Technology is designed around Digital Persona U.are.U 4500HD fingerprint sensor for use in high throughput settings and is built to last. This rugged, durable, ergonomic, affordable fingerprint machine. A wealth of experience across many real-world implementations has led us to extensively test and support multiple fingerprint scanning technologies, ensuring that you have the right options for success. The M2-S™ fingerprint scanner was designed for use with the M2SYS Hybrid Biometric Platform™ and is also compatible with many standard fingerprint software development kits (SDKs). Our most durable fingerprint scanner, the M2-S™ ergonomic design forces perfect finger placement with each fingerprint scan to produce an optimized fingerprint image with a maximum captured surface area. This fingerprint scanner was designed around the Digital Persona U.are.U 4500HD (high-durability) fingerprint sensor — image capture, self-calibration, and image data encryption are controlled by its on-board electronics. 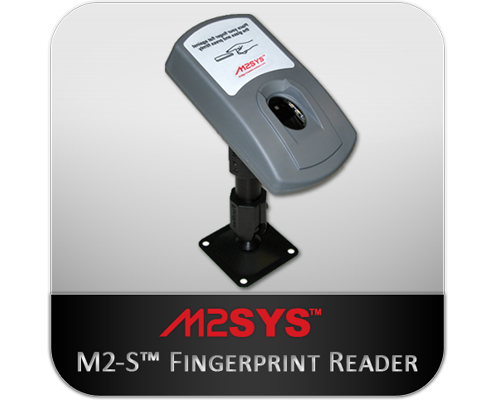 The M2-S™ fingerprint scanner provides reliable, accurate, and virtually fool-proof fingerprint recognition. The “smart-touch” scanning area enables the fingerprint reader to reject latent and counterfeit fingerprint images. M2-S™ is an affordable USB fingerprint device with a rugged design and durable frame, providing sturdiness unmatched by other fingerprint scanners in the same price category. 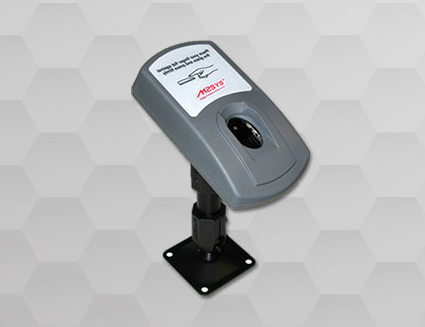 In addition, the bottom of this fingerprint scanner has a mounting hole, allowing it to be easily secured to any surface.